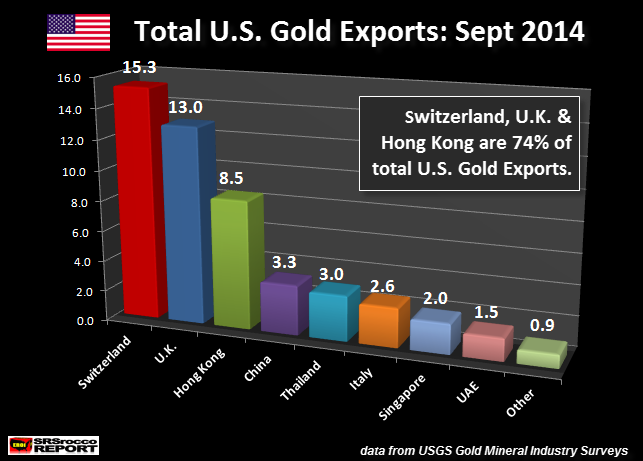 According to the USGS most recent data, total U.S. gold exports increased significantly in September. Not only did U.S. gold exports surge in September, they were 70% higher than the previous month. This was probably due to increased demand as the price of gold declined $80 during the month. China also received a direct shipment of 3.3 mt of gold while Thailand imported 3 mt, Italy 2.6 mt, Singapore 2 mt, and the UAE 1.5 mt. What is interesting here is the 2.6 mt of U.S. gold exported to Italy. Italy has imported gold scrap from the U.S., but not much in the way of gold bullion. Matter-a-fact, I went back and looked at the past ten years of USGS Gold Yearbooks and only found one entry listing U.S. gold bullion exports to Italy in 2009 at a paltry 21 kilograms, which is 653 troy ounces. Compare that to the 2.6 mt or 83,590 troy ounces of gold exported to Italy in September. U.S. gold exports for the first nine months of 2014 are down compared to the same period last year. 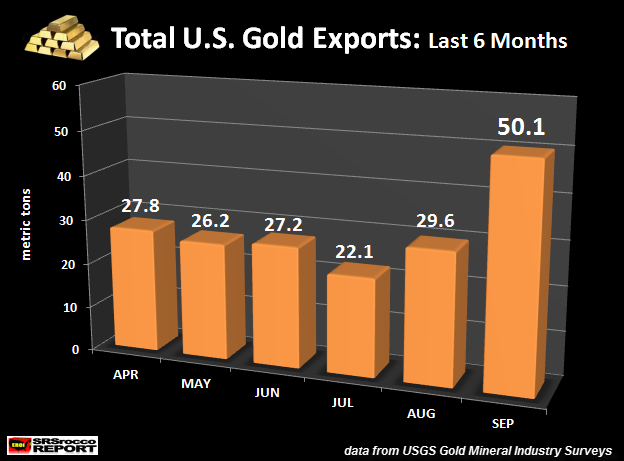 From Q1-Q3 2013, total U.S. gold exports were 573 mt compared to the 370 mt in the first three quarters of 2014. However, the price of gold fell to a new low in November, thus gold exports from the U.S. may continue to be strong for the remainder of the year. This entry was posted in news and tagged china, currency wars, Financial Crisis, Gold, gold manipulation, market manipulation, palladium, platinum, PMC Ounce, precious metals, rigged markets, silver, US Dollar on December 26, 2014 by Site Admin.